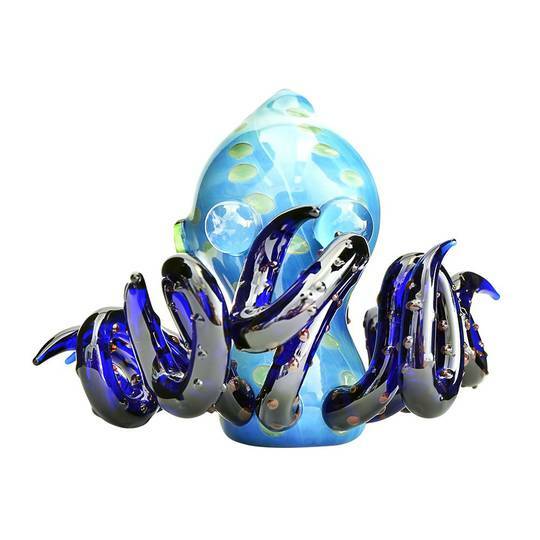 As if 20,000 Leagues Under the Sea were captured in high quality borosilicate glass, this USA Blue Glass Octopus Hand Pipe finds a bulky aquatic leviathan serving up fresh hits of smoke. Glass tendrils writhe about with one protruding toward you, serving as the mouth piece to this complex smoking pipe. Textured glass rivets run the length of the tentacles, offering you grip support. Crafted carefully in the U.S.A., this unique piece is similar to heady glass in its attention to detail. The 6” length isn’t too cumbersome but provides enough mass for this to be a smoking pipe that demands your attention.